What next for the Sanders campaign? By Fred Goldstein posted on July 20, 2016. Bernie Sanders has given an early, pre-convention endorsement of Hillary Clinton as the Democratic Party nominee. Thus, the battle that he promised, of fighting all the way to the convention, is largely over. Sanders officially got 12 million votes. He probably received at least 1 to 2 million more in California, which have not yet been counted. Several million more Sanders supporters could not vote for him because of closed primaries and restrictive registration rules in major states. From the very outset, the Sanders campaign was wrapped in a severe contradiction. Sanders was advocating a rebellion against Wall Street, against income inequality and for basic economic rights. Yet he fought from within the Democratic Party, which is the party of Wall Street, big business and the Pentagon, as it has been for the last century. Now he has chosen to remain in the Democratic Party, whose leadership is profoundly opposed to Sanders’ goals. To be sure, Sanders would never have been able to have the national impact he did had he not run in the Democratic Party presidential primaries. This is a reflection of the undemocratic nature of the U.S. electoral system. The winner-take-all elections, the absence of proportional representation, the enormous petitioning obstacles to getting on the ballot, and the control of electoral publicity by the media monopolies are guaranteed to keep the working class and the left on the margins of electoral politics. Despite that, the Sanders campaign has shown the great potential for a real grass-roots rebellion against the political establishment. But it has also led to his present contradiction of backing Hillary Clinton, the very establishment candidate he fought against. But that is his contradiction. The movement that supported him must not be locked into that contradiction. The question for millions of followers of Sanders is, what to do now? Should they hold their noses and run to the Clinton camp on the grounds that Trump must be defeated, or should they chart an independent course? The answer at the moment is that the most important thing to do for the future of the movement in the U.S. is to chart an independent course. The answer for what to do about Trump right now is to fight him with demonstrations and disruptions wherever he and his racist, anti-Muslim, anti-immigrant, anti-women forces appear. The electoral question should not become a reason to give up the freedom to wage an independent struggle against the big-business establishment, as represented by the two capitalist parties — the Democratic Party leadership as well as the Republicans. The elections must not tie the hands of Sanders’ supporters who want to continue and deepen a progressive and revolutionary struggle. The Sanders movement must chart a course that at least includes what they were fighting for when they voted for Sanders in the first place. It must escalate the fight against the rich and their obscene salaries and profits, the fight against the giant banks, for universal health care, for free college tuition, for an end to student debt, to stop the polluters and climate change, for the right to a union, for a woman’s right to choose, an end to deportations and so forth. These were the premises of the Sanders campaign. This program must not be abandoned or left in the hands of Hillary Clinton and the big-business dominated Democratic Party. And because Sanders’ program was limited, the movement has a chance to go far beyond it. A truly comprehensive, independent course must be a working-class course. It must be based on solidarity with oppressed people at home and abroad. 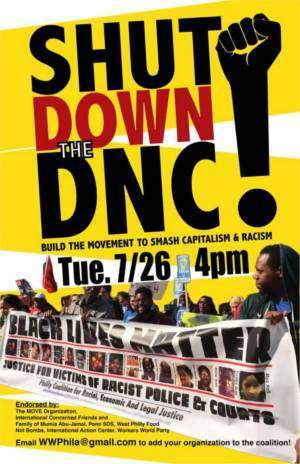 It must support the Black Lives Matter movement against police terror, the movements against Pentagon aggression, deportations of immigrants, and the persecution and exploitation of undocumented workers. The other vital question is: Should an independent course take an exclusively electoral form, or should it be broadened and sharpened and taken to the streets, the workplaces, the communities and the campuses? Given the momentum of the Sanders campaign, many want to pursue an independent electoral course. And there is nothing at all wrong with a truly left, independent electoral campaign. But it must be accompanied by a campaign of struggle. What the establishment really responds to is mass resistance, protest, demonstrations, occupations, sit-downs, strikes and everything that interferes with business as usual. History shows that legislative victories that improve the life of the people in a significant way are the result of mass struggle. The right to organize mass unions was won by hundreds of plant occupations and sit-down strikes in the 1930s. Civil rights were won by African Americans and their allies in the 1950s and 1960s all over the South, confronting the police and racist forces, at great sacrifice. Poverty programs and affirmative action were won after hundreds of urban rebellions in the North. The right to abortion was won by mass marches and countless demonstrations by women all over the country. Gay and lesbian rights began with the Stonewall Rebellion in 1969 and countless mass demonstrations after that. Such examples could be multiplied endlessly. Now Sanders and many of his top supporters in the Democratic Party are claiming that the victory of his campaign is represented by “the most progressive program” in party history. The Democratic Program Committee accepted some of Sanders’ program, but rejected major portions of it. However, that is not the fundamental problem. The real problem is that the first thing to go into the waste basket if the Clinton machine gains the White House is the program. That has been true of all previous Democratic Party programs. The Democratic Party is a capitalist party. As such, no bourgeois leadership is bound in any way to carry out the party program. This is unlike a working-class party, in which the leadership and the rank and file alike are bound to support and fight for the party program. In working-class parties, the program is decisive. In bourgeois parties, the program is just window dressing. Sanders is trying to persuade his followers that progress in the Democratic Party program is a step on the road to a political revolution in the U.S. Should Hillary Clinton get into the White House, however, she will be at home surrounded by Pentagon generals, the CIA, the FBI, bankers, the entire upper echelons of the capitalist state, not to mention business lobbyists, influence peddlers of all types. It will be her job to defend U.S. capitalism and U.S. imperialism. Generations of progressive activists and even revolutionaries have tried time and again to gain a foothold in the Democratic Party in order to “transform” it and push it to the left. This has always been a trap. They have always had to sacrifice their principles and their struggle while the imperialist Democratic Party leadership attacks the masses and carries out one war and intervention after another — from World Wars I and II to Korea, Vietnam, Afghanistan, Iraq, Libya, and on and on. And let’s not forget that Hillary Clinton, as President Obama’s secretary of state, was the leading force advocating regime change in Libya; was a strong supporter of the overthrow of the Assad government in Syria; and defended the coup in Honduras. She also denounced “superpredators,” referring to Black youth, in support of Bill Clinton’s crime bill of 1996, which greatly increased mass incarceration. Let’s not forget how the Clinton machine destroyed welfare, known as Aid to Families with Dependent Children, throwing millions of single mothers and their children into poverty. Nor should we forget the Antiterrorism and Effective Death Penalty Act, which severely limited habeas corpus appeals by death row prisoners. All this gives the lie to her attempts to paint herself as “progressive” in the current presidential campaign. Let’s remember how the Clinton machine launched the Yugoslav War and the bombing of civilians in Serbia, continued the Iraq sanctions started under George H.W. Bush, which killed half a million children, and repealed the Glass-Steagall Act, which had been enacted during the Great Depression to put some regulations on Wall Street. This is just a selection of some of the reactionary policies of the Clintons, as well as previous Democratic administrations. While the Sanders campaign represented a sweeping electoral rebellion against the Democratic Party establishment, his program was a relatively mild one. But U.S. politics are so reactionary, including Democratic Party politics, and the crisis of the people is so deep on so many fronts, that the Sanders program caught on and understandably generated enormous enthusiasm. Big business is so dominant in U.S. politics that even demands for basic reforms like breaking up the big banks, Medicare for all, free college tuition, eliminating student debt, strengthening the right to organize, opposing anti-worker so-called “free trade deals” and so forth were like a breath of fresh air and captured the imagination of millions. Sanders talked about carrying out a “political revolution” in the U.S. By political revolution he meant his reformist program. While he called himself a socialist, he never attacked capitalism as a system. He never called for socialist measures to end the people’s suffering. A real political revolution means that the workers, the oppressed communities, women, LGBTQ people, immigrants — all must be in charge of their fate. They must not have to rely on capitalist politicians who serve the rich to determine what happens to them, while year after year they try to survive and can gain only the most meager concessions. For there to be a political revolution in the United States, there has to be a social revolution. The capitalist class, its state, its property, its machine will have to be broken up. The vast resources in wealth that the working class has created will have to be put to use in a planned way, not for profit but for human benefit and well-being. When the workers and the oppressed are in charge, that will be a genuine political revolution. A party that advocates and fights precisely for a socialist form of revolution is Workers World Party. It is running an election campaign, but one that is aimed at keeping the movement in the streets, not diverting it to the ballot box. To struggle for revolutionary socialism, solidarity with the workers and oppressed at home and abroad, become part of the Moorehead-Lilly campaign: #socialists4blacklives on Twitter and Monica Moorehead & Lamont Lilly 2016 on Facebook.